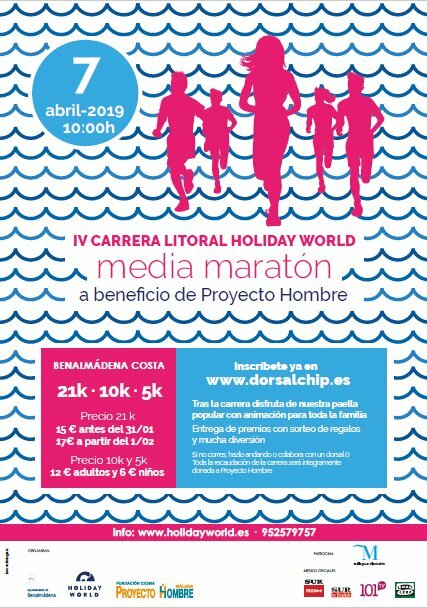 The City of Benalmádena and Resort Holiday World will organize the IV Carrera Litoral Holiday World, a charity race to raise funds on behalf of Proyecto Hombre. There will be 5 km, 10 km and 21 km (half maraton) races, designed for those who are released to run. All races will begin and end its itinerary in Rotonda de los Elefantes (bus stop Holiday World), and will take Avenida Costa del Sol towards Málaga until restaurant El Embarcadero (5km race), Avenida Las Palmeras (10 km race) and Puerto Marina (21 km race) to return to the starting point and complete the course. The event will take place at 10:00 hours. Benalmádena Police will enable Avenida Costa del Sol (sense to Fuengirola) with one lane for each direction, so, these bus lines will not make its usual bus stops. However, it could be some delays because of restricting movement to one lane in each direction. Further information can be consulted on our new mobile app Consorcio Malaga (available for Android and iOS), on the Consortium’s web, on its official Facebook , Twitter, YouTube and Telegram page, or by calling the customer service line on (+34) 955 038 665.